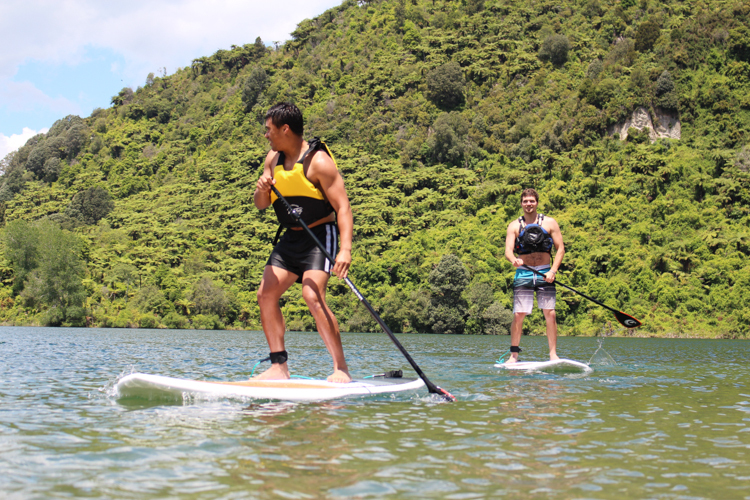 Rotorua’s Jetboard Adventure Tour is one of the newest unique tour experiences in Rotorua providing an amazing emission free and eco friendly cruise, touring some of Rotorua’s most scenic lakes, on an easy to ride jet powered stand-up paddle board making it great fun for everyone including families, tourists, nature seekers, fun seekers, adventurers and suitable for novice paddlers to the experienced. 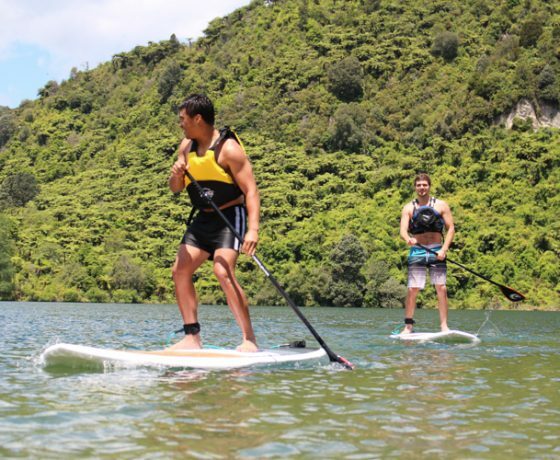 Rotorua’s Jetboard Adventure tour is a fully guided jetboard tour on some of Rotorua’s scenic local lakes. The best lake location is selected by the guide only hours before the tour to ensure optimal conditions for your experience. 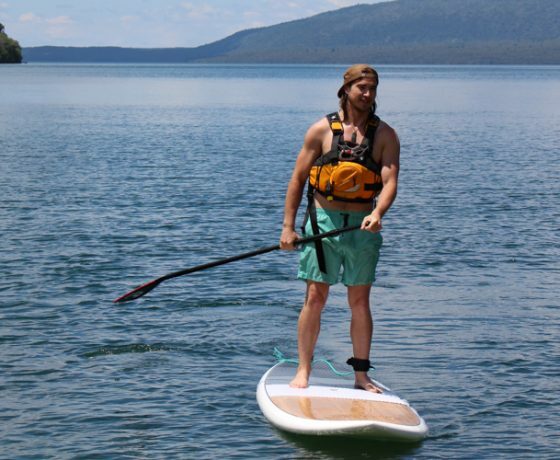 You will be joined on tour with other jetboarding fun seekers ready to soak in all the natural surroundings. 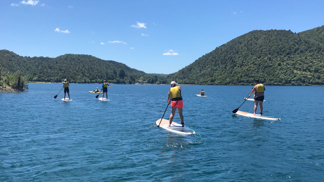 The tour is suitable for beginners to experts and is an amazing time out on the lake, sharing the freedom of interacting with nature in a new and unique way. All necessary equipment is provided, including expert instruction by one of our fantastic and expert guides.Booking is essential. 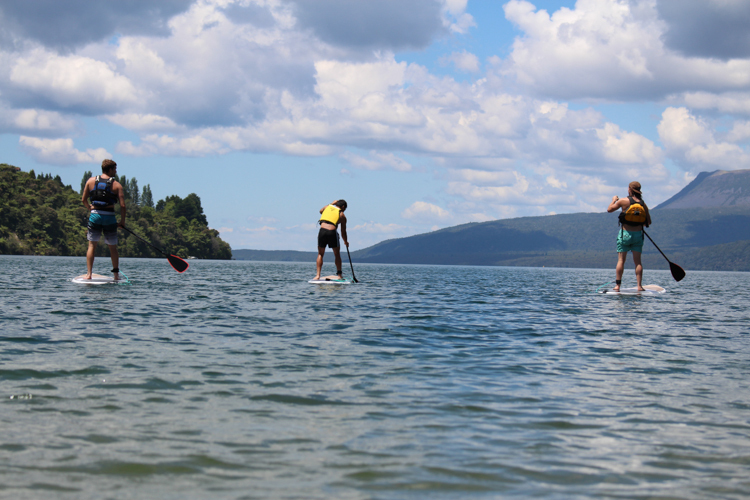 We provide a shuttle service to and from your Rotorua accommodation or the I-site in central Rotorua. Allow 3 hours for the round trip. 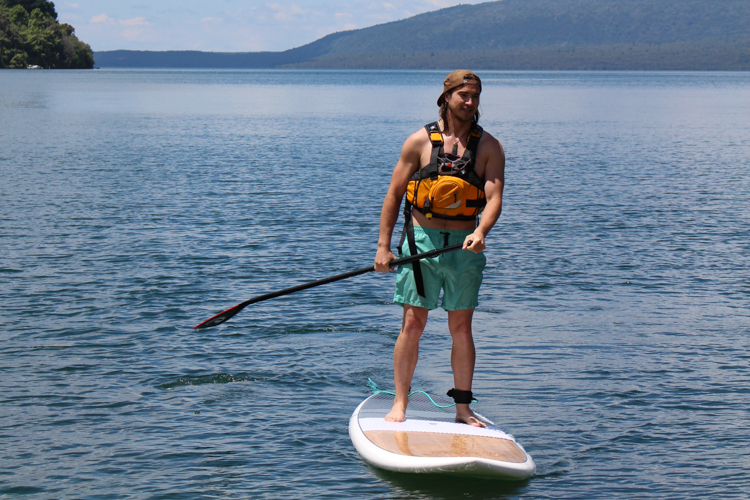 The maximum number of customers per tour is seven, so book in quick! 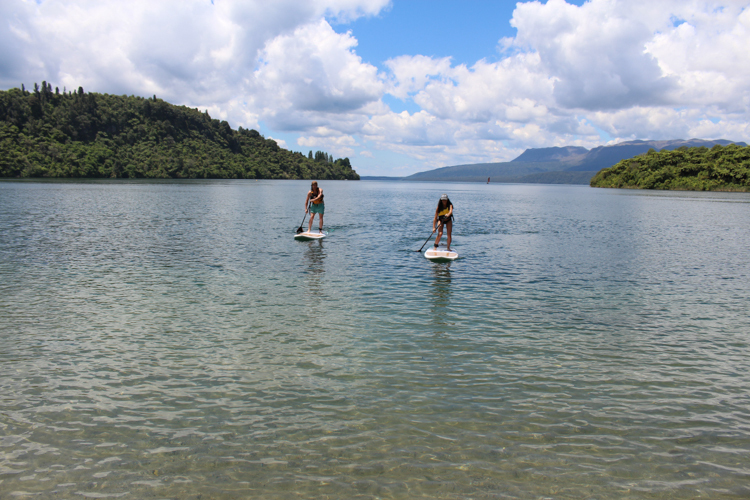 Our Stand-Up Paddle Tour is one of the best ways to see our local lake scenery. 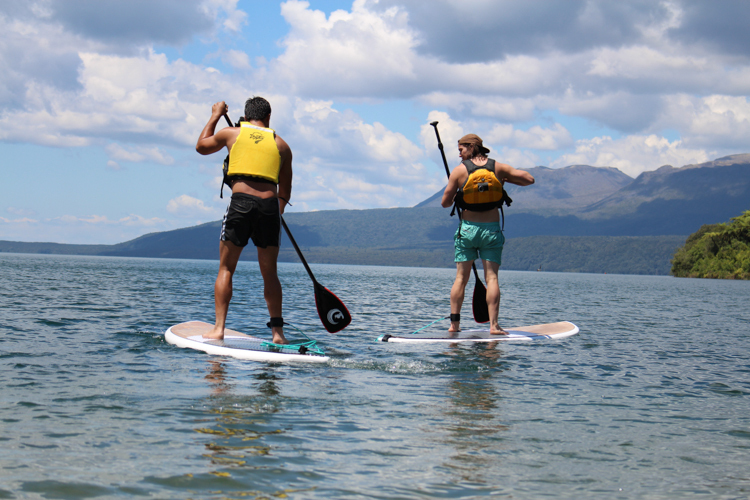 In the hands of our friendly and customer focused local guides who are passionate about experiencing all the outdoors Rotorua has to offer, you will be taken to locations that not even other locals know about. 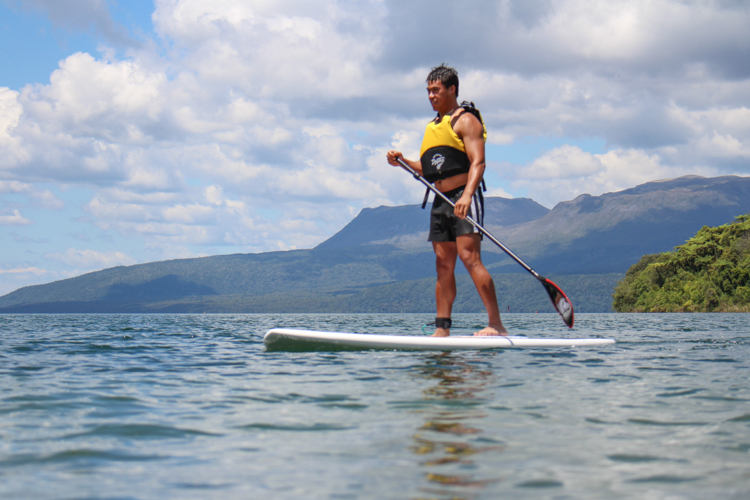 You will see the lakes with a new perspective, learn new skills, have a great time and enjoy our high quality paddle boarding equipment. 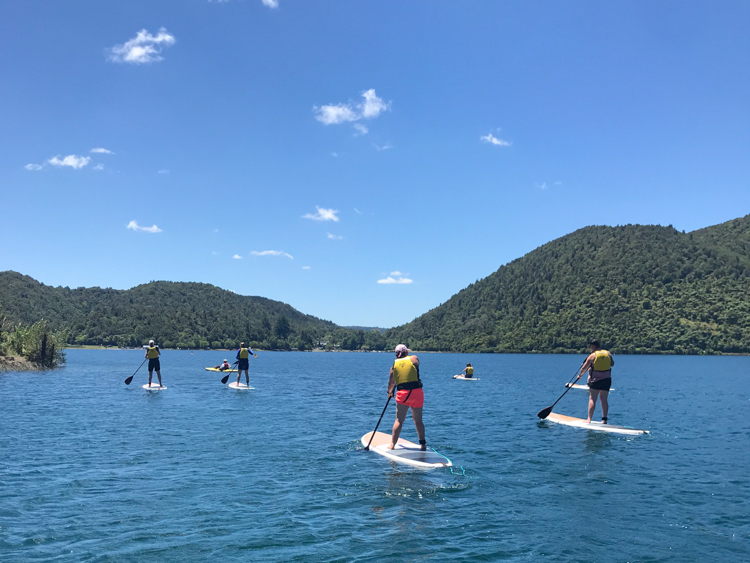 The best lake location is chosen by our knowledgeable guides only hours before your tour to ensure the optimal experience for the days weather conditions. Suitable for all ages above 5 years old with a guardian and above 16 years old with no guardian. A great activity for everyone. If you have special needs and would like us to cater a tour to meet your requirements, just get in touch with us and we will tailor a little something especially for you. A weight limit of 105kg applies. 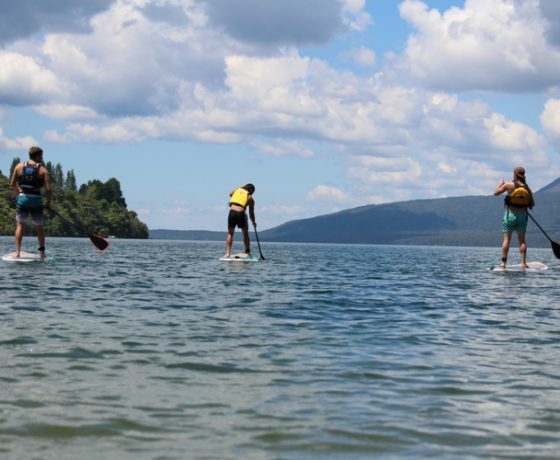 Appreciate the convenience of a complimentary pick-up and return transfer from your central Rotorua accommodation or the Rotorua I site at 1167 Fenton Street, Rotorua. 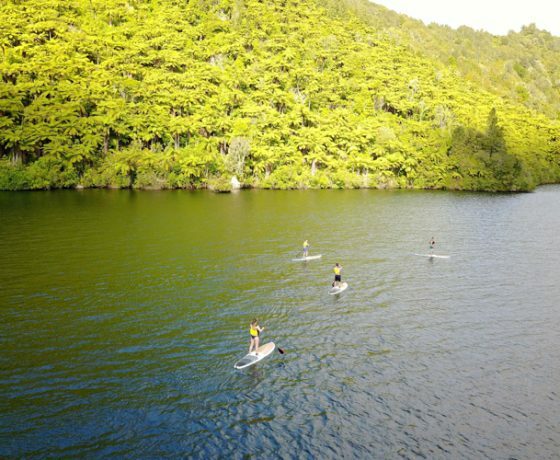 Departing Rotorua a 15-20 minute drive begins during which time you will meet your small-group tour members as you descend to the lake which is home to hidden cave and rock formations perfect for exploration. 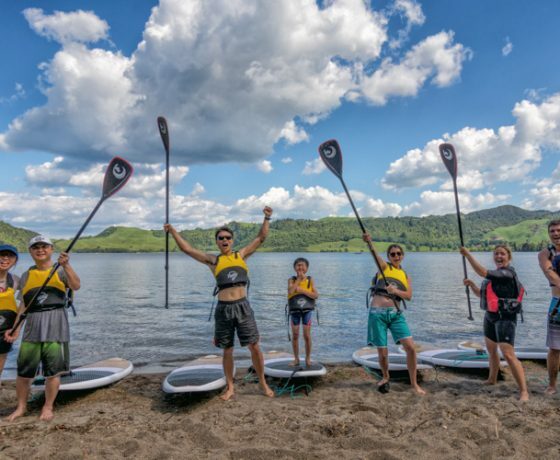 Upon arrival at the lake your guides will unload all the necessary equipment as you enjoy the beach before you take to the waters on an amazing stand-up paddle board twilight tour. 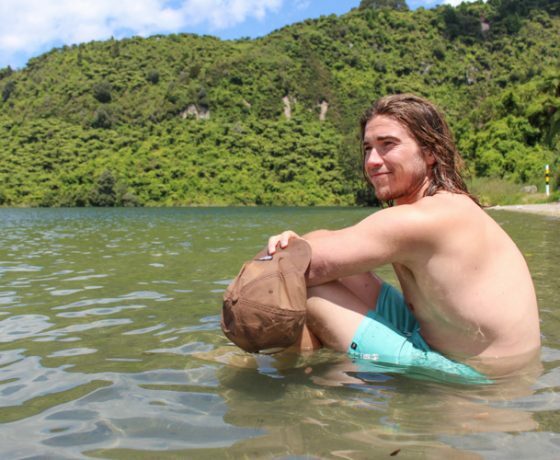 Make your way across the pristene lake to a cave filled with Glowworms. 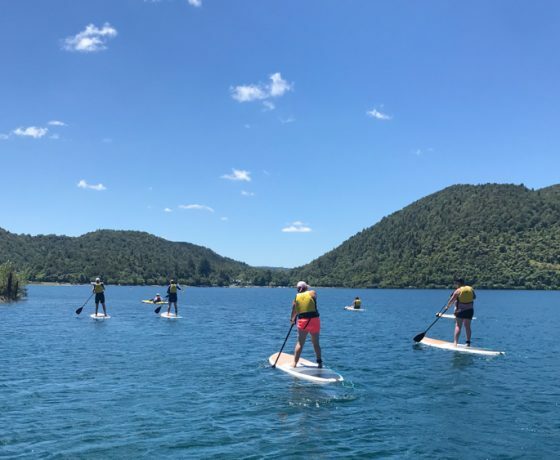 With knowledgeable and expert local guides ensuring you master stand-up paddle boarding quickly and keeping you together and on-course in the dark, you are sure to have an unforgettable night. 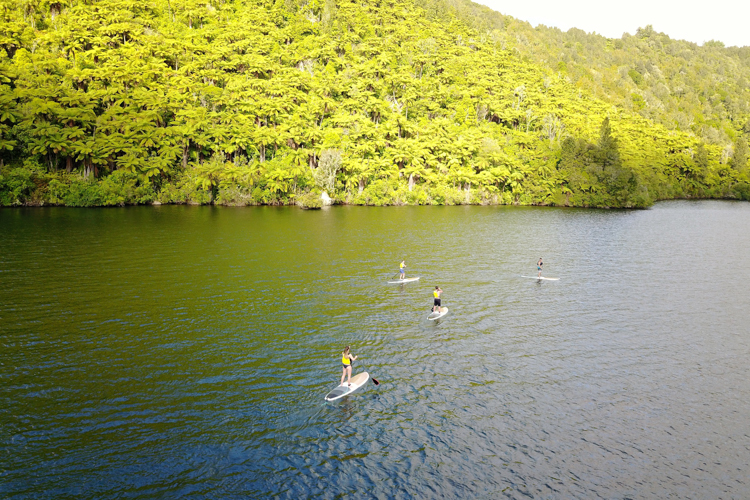 The return shuttle transfer back to Rotorua is a time to relive the highlights of the experience and form lasting memories of your tour. 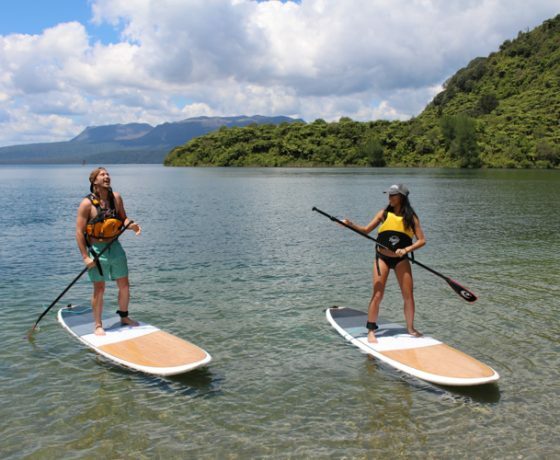 Departing Rotorua a 15-20 minute drive begins during which time you will meet your small-group tour members as you descend to the lake which is home to hidden cave and rock formations perfect for exploration. 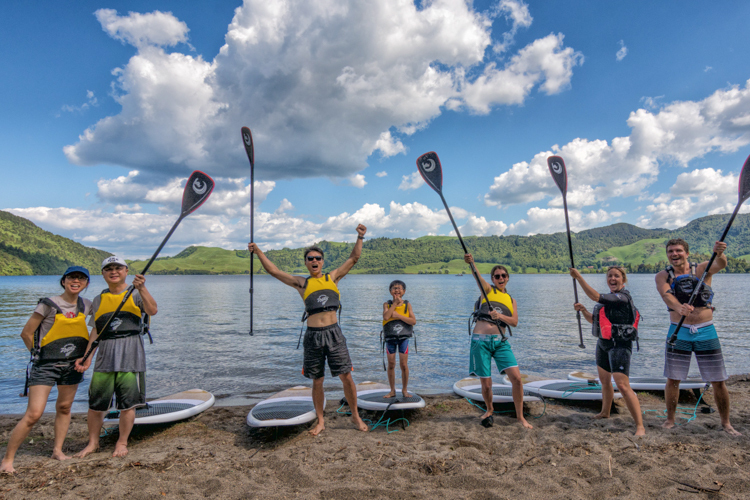 Upon arrival at the lake your guides will unload all the necessary equipment as you enjoy the beach before you take to the waters on an amazing kayak twilight tour. Discover hidden caves home to amazing galaxy formations of glow-worms. 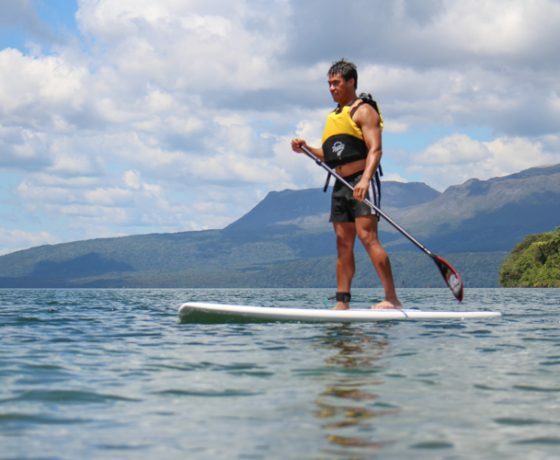 With knowledgeable and expert local guides ensuring you master kayaking quickly and keeping you together and on-course in the dark, you are sure to have an unforgettable night. 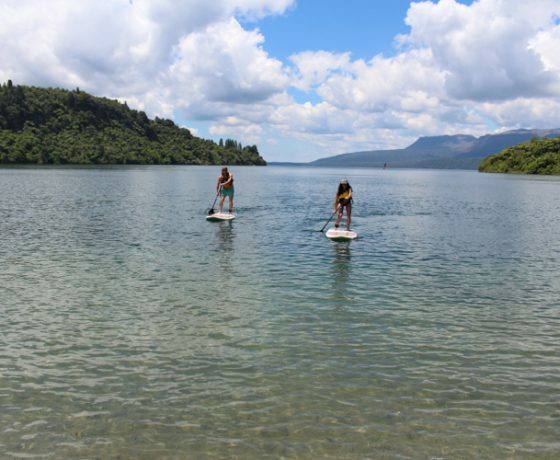 The return shuttle transfer back to Rotorua is a time to relive the highlights of the experience and form lasting memories of your tour. 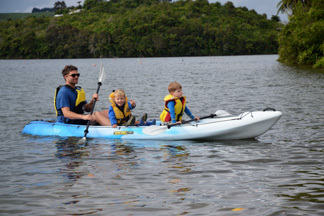 This tour is perfect for complete beginners and families as the kayaks are suitable for two persons and a child and are very easy to paddle and very stable. 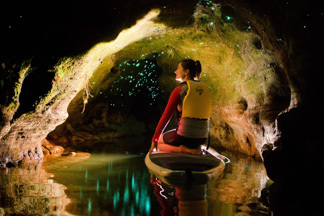 The Pedal and Paddle Glow Worm tour is a specialised guided tour unique to New Zealand’s North Island city of Rotorua. 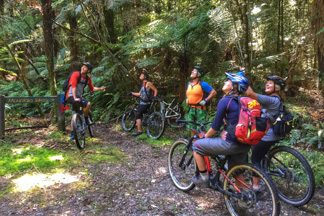 Start with a ride through the iconic “Redwoods” with it’s numerous layers of tree ferns, emergent trees and amazing trails to suit anyone’s taste. 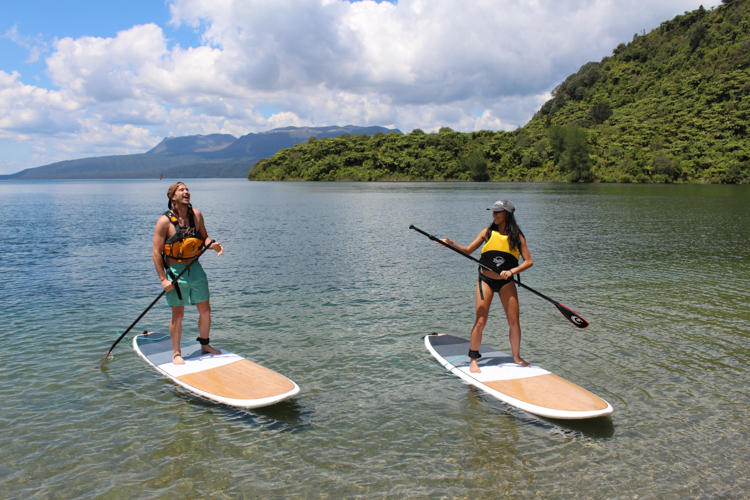 A sumptuous dinner follows our ride and then we’ll head a short distance out of town and paddle stand up paddle boards into some magnificent glow worm caves on the pristine Lake Okaraka. There’s no better way to spend an afternoon and evening! Complimentary pick-up & return transfers along with all the equipment you need is included in this awesome tour. Enjoy the convenience of a complimentary pick-up and return transfer from either the Rotorua I-Site at 1167 Fenton Street or your central Rotorua accommodation. Meet your local guide and small group of no more than seven tour members on a 5 minute drive to the iconic “Redwoods” forest. Gear up for your ride with all high quality mountain biking equipment provided and then follow your guide into the forest. 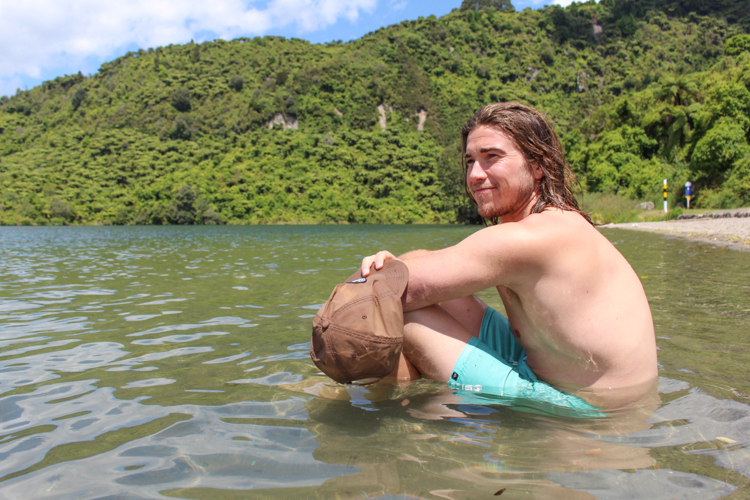 Ride the best trails New Zealand has to offer with plenty of places to catch your breath and take in the surroundings. 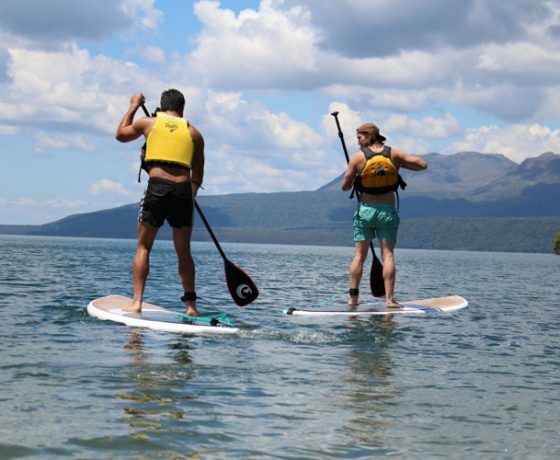 Ride until the afternoon turns to evening and then return to the Redwoods carpark and shuttle back to town where a sumptuous dinner and beverage is just what you will feel like before departing on a short 15 minute drive to Lake Okareka. Once at the lake you will be guided along the shorelines as the sunsets to a series of secret caves home to a magnificent array of glow worms, an amazing way to finish a perfect afternoon and evening experience. N.B. We will do our best to get in touch well in advance if the weather looks bad, unfortunately sometimes mother nature wins. If our regulations allow us to operate then we will operate. A weight limit of 105kg applies. Suitable for all ages above 6 years old. All children (16 and under) must be supervised by a responsible adult (18 or over). A parent and child can use one board if desired provided the combined weight of the parent and child is less than 100kg.